We've had a lot of our customers and WordPress users in general have an issue where their site is showing a blank page. This blank page is typically caused by a PHP error. If you have your php.ini file set to hide php errors, you'll get a blank page displayed. WordPress users rejoice, we now have an optimized WordPress Hosting package! Check it out today. 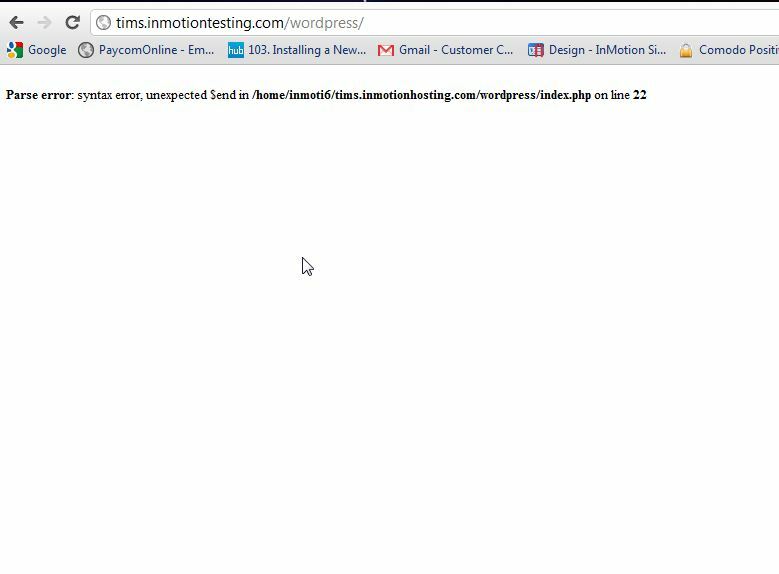 To diagnose PHP errors in WordPress, we will place a line of bad code in the site to show what happens when WordPress encounters and error. The image to the right shows my fully functional WordPress website. 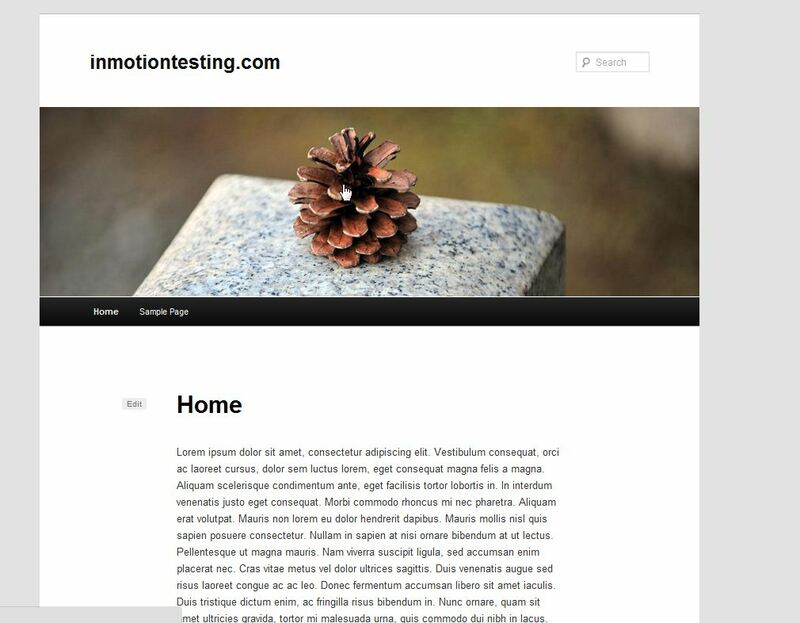 We will add code to the site to intentionally break the WordPress site for testing purposes. See image to the right where it says "I am forgetting my closing quote". Now that we've added the code to intentionally break the website, you will see the WordPress website displays a blank page. Note! We don't see the PHP error message because we have set the directive in the php.ini file to hide error message. To fix this, we'll simply need to update it so it shows error message. Edit your php.ini in your public_html folder. To learn how to edit your php.ini page, see our tutorial on "How to update your local php settings". Find the error_reporting section in your php.ini like the image to the right. Change the display_errors from Off to On. Now, since we have adjusted the display_errors in the php.ini file, as you can see our site now displays the exact error message causing the issue and we can start to troubleshoot it! See snapshot to the right. One way to find error messages is to view the error_log file in file manager. All PHP error messages are logged to this file. You can use FTP or the File Manager in cPanel to view this file and any of the error messages logged. 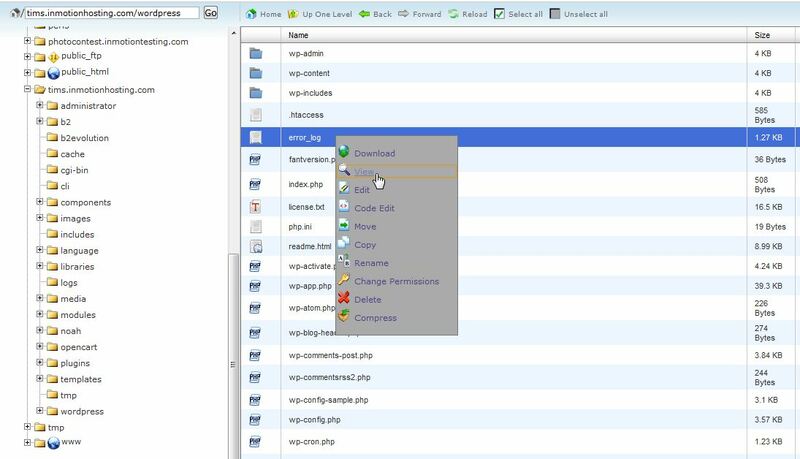 Login into your cPanel and go to the public_html in your File Manager and click go. Right click the file and select view. 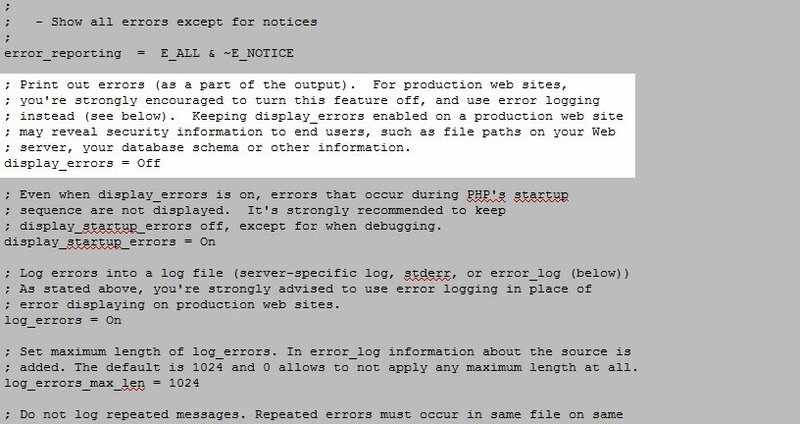 Now you can see the list of errors that your website is causing. In this case, the syntax error shows because we broke a line of code intentionally. Being able to view the actual error message causing your blank screen is important when trying to resolve this issue. You can either attempt to debug the issue yourself or pass it on to your designer. Huge thanks.I was able to find the error & solved it. Hey team, below is the error code im getting. Are you able to help me understand the error and what would be the easiest way to fix. Hello, sorry to see that you are receiving that error. From what the error is indicating there is an issue with the location of the file/script app/Mage.php. Is that a script that is required for your website? I am unable to duplicate the problem that you are seeing. We can see the website with no issues here. Can you check your website from another device or location? If your site does go down again, please contact our live technical support team (contact info at the bottom of the page) and then provide immediate assistance. In my site home page is blank and rest of page is working as given theme. Please help me. It's difficult for us to help you without at least the URL of your website in order to diagnose the issue. Additional information like the software you are using to build the site (WordPress, Woocomerce, etc. ), error messages, or the steps to duplicate the problem are also helpful. If you are an InMotion Hosting customer you can get immediate help using the contact information at the bottom of the screen. I recommend following our WordPress Troubleshooting guide to narrow down the cause further. ISSUE - BLANK PAGES IN WP PAGE EDITING: "Visual" Tab - contrary to having access to Coding on the "text" Tab... and able to view content on the Website. Im using a Static WP site. I've transitioned to HTTPS with cloudflare using WP EASY SSL. on the settings page there is a “mode” button which can be “OFF” ... switch this to “cloudflare mode” and content should now be viewed in the EDITOR "visual" tab (as well as the "text" tab). Leave this with you, with enthusiasm. Coordinator - Mens Elective Network. 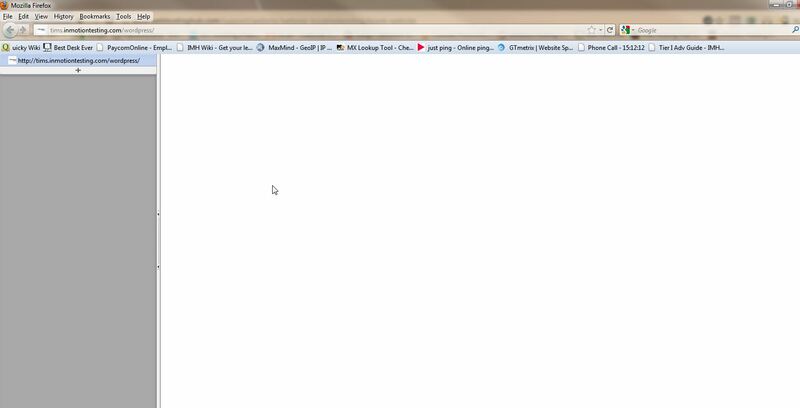 Seeing complete blank page in hm-enterprises.com in Chrome and Firefox. In opera it is working fine. Any fix. Cache has been cleared. 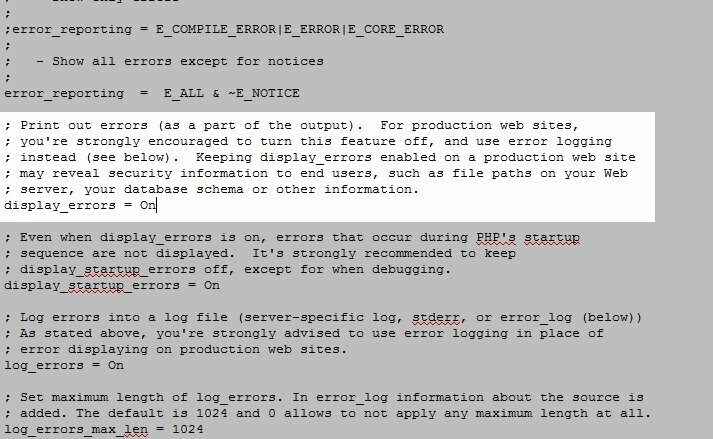 Are there any errors reported in the logs of your server when you enable errors as this article suggests? I am getting a blank screen each time that I try to edit or connect with any other page other than the home page. Kim, what does your error_log file say? hi ,I think my problem is quite differ, Front end display a blank page and Back End working absolutely find. To rectify I simply change the them and it will become perfect. Plz tell me the permanent soluttion of this problem because everytime i set new theme and same problem repeat with in 3 days. Hello, sorry for the problem. In order for us to help you, we need more information like your domain name, the version of WordPress you're using, error messages, and steps to duplicate the problem. If you're a customer of InMotion, then please provide your URL at least and we can look at the account. If you're not a customer, I would recommend you simplify the installation to use NO plugins or default themes, then see if the problem persists. 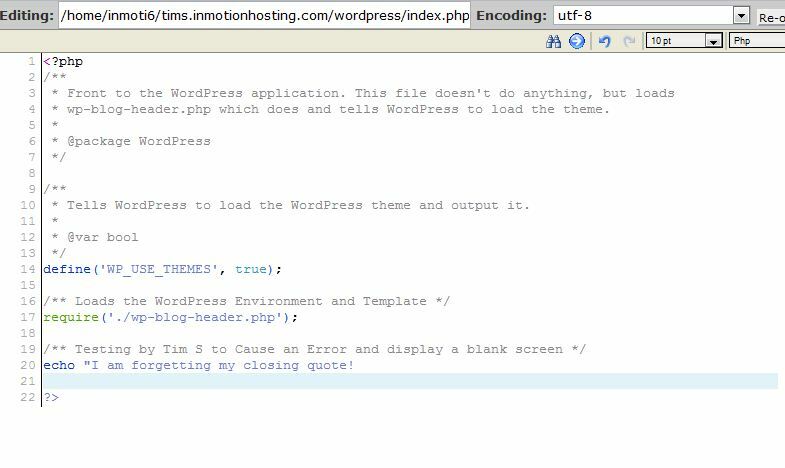 Also use make sure that the debug mode for WordPress is turned on. Please provide us more information if you wish for us to investigate issue in more depth.